Our second God child is Xin Xu, a three and half year old girl, who lives with her parents and six year old brother in central northern China, in the province of Liu Shu. Her parents are farmers and they live together in a clay/brick house which has electricity. Xin’s mother uses charcoal to cook. Xin’s brother collects water twice a day from a river. Due to the drought he sometimes has to walk 15km a day. Xin will take over this job when she is old enough. As there is no kindergarten, Xin spends a lot of time with her friends in the neighbourhood. Xin’s father earns 843 Yuan a year, that is an annual income of 124€. Also here our God Child scheme should help to improve living conditions and basic medical care. 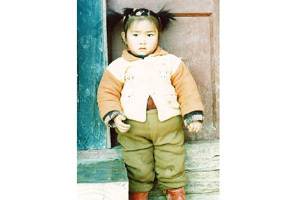 In June 2006 we received some more information about Xin Xu: with our help she can now go to Primary School. Xu is very proud of her country and wants to become a good pupil. Our support also helps to provide acceptable conditions for her school visits, helps her to become a good member of society, and gives her more opportunities in her civic and social lives. Xu has celebrated Chinese New Year together with her family and friends and was even able to watch the various ceremonies on TV. She is very proud to have a godfamily in Germany which she tells everybody all the time.